Did a form of complementarianism set Freud on the road to analysing female psychological dysfunction? 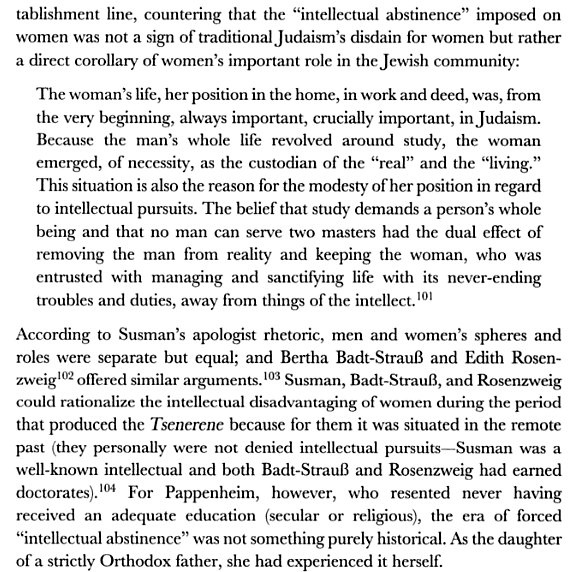 In 1920, she was recruited by Martin Buber and Franz Rosenzweig to teach at the Freies Jüdisches Lehrhaus, a center for Jewish studies they had founded in Frankfurt and where she mingled with Siegfried Kracauer, Shmuel Yosef Agnon and Gershom Scholem. In Let Me Continue to Speak the Truth: Bertha Pappenheim As Author and Activist by Elizabeth Loentz, pages 47 and 48, we can read about the disagreement between Bertha Pappenheim, who felt unfulfilled by her education or by her career prospects as a woman, we are not sure which; and Edith Rosenzweig, Franz Rosenzweig’s wife, who had a doctorate and did not consider that she experienced intolerable restrictions as a woman.